San Francisco Silent Film Festival - The Battle of the Century and Other Comedy Restorations! The Battle of the Century and Other Comedy Restorations! 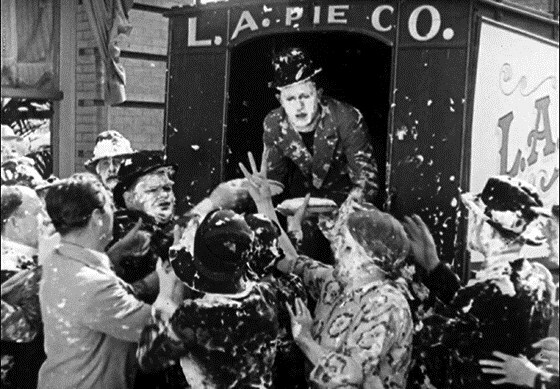 Jubilation resounded throughout the film world when film collector Jon Mirsalis announced the recovery of the long-lost reel of Laurel and Hardy’s The Battle of the Century containing the deliriously epic pie fight. Serge Bromberg and Lobster Films stepped in to restore this raucous short, which required an entire day’s output of the Los Angeles Pie Co. SFSFF presents the reconstructed film’s San Francisco premiere, along with three other Lobster restorations: two inspired shorts by Buster Keaton, Cops and The Balloonatic, and the giddily bizarre Pathé short, The Dancing Pig.